The Ides of March are upon us. I think Shakespeare has something to do with it. A time of profundity but I’ve forgotten why. How pitiful is that? As we approach the balance of light and dark, our weather suggests that nature is in turmoil. I’m grateful to be inspired by the quickly changing moods. First rain, then hail, then sun, then rain, then thunder, then a few peeks of blue sky, then rain, torrential rain this time – and this has been going on for days. The earth is getting soggy around here but it still seems serene in comparison to what’s happening on the other side of our tiny globe. Awe inspires me. The amazing ways of water and the mysterious deeps of our oceans reveal the real proximity of our lives on this tiny planet. Within only a few hours, those of us on the west coast of our North American continent were experiencing the consequences of earth’s upheaval in Japan. Isn’t that a marvel? And the potential of nuclear melt down and the possibility of major radioactive fall-out promise to link us even more deeply as a global community. We are truly in this catastrophe together. We humans are waking from a long slumber of illusion. No one is immune from disaster. Some things can’t be fixed by technology and wealth. We’re waking up as a species. Many of us are changing our attitudes about what makes us happy, what gives life meaning. And that excites me. Along with longer hours of light returning, my own artistic vision is shifting and bubbling. I took an art class from a fine woman and gifted artist last Saturday. First class I’ve taken in more than a decade I bet. Her name is Michele Zarb and you can see her work here. Her use of color is totally different from mine and I can hardly wait to see how her multi-media techniques will influence my own imagery. Here’s an example. Years ago when I first began painting, I painted this image called “Living in Balance.” Kind of wyrd that I bring a picture with that title to you now in this particular post at equinox. It’s about life feeding on life. 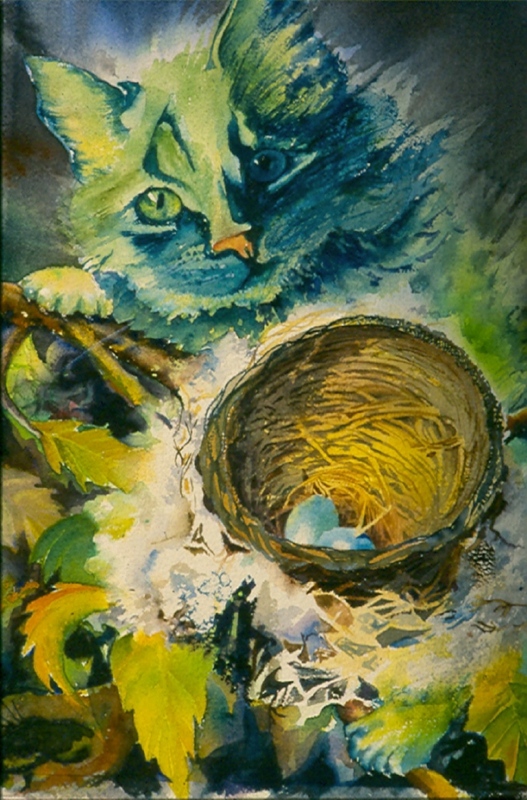 I’ve always loved the nest and the eggs. . .their vulnerability and their potential gift to the cat. Here ‘t’is. On Saturday, when it was our turn to draw a picture and experiment with these new techniques, I was drawn to a photo of a nest with eggs in it. 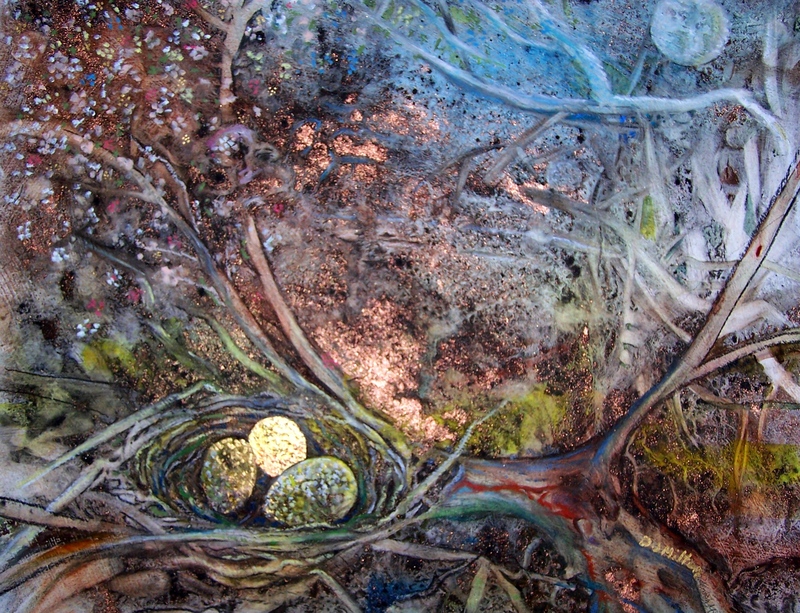 Without thinking at all of my old nest image, I painted this new one using charcoal, acrylic, dry pigments, metallic pigments, oil pastels and colored pencils. It was only after I got home that I remembered my earlier image and thought about the contrast between the two. I’m not yet sure what I think of the more limited color palette. I’d love your feedback! I intend to experiment tomorrow with my typical watercolor palette but with many of Michele’s dry pigment techniques, including the black charcoal. I can hardly wait to see what happens next, both here in my small world and there in the greater one. With love winging to all life, I bid you good-night. This entry was posted in mystery, vagaries and tagged awakening, balance, changes, equinox, global community, trying new things. Bookmark the permalink. Happy Saint Patty’s day…… Sure wish you were here for the two day celebration…. I will put photos here of my party soon… LOVE YOU..